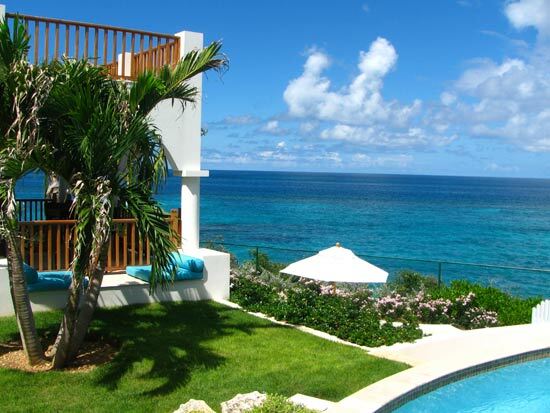 Anguilla Luxury Villas: Our Luxury Anguilla Vacation Away From... Anguilla? 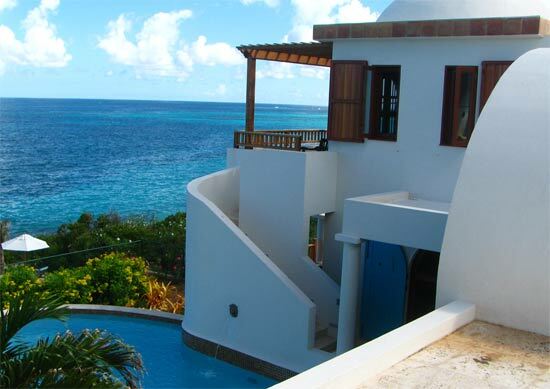 Our Luxury Anguilla Vacation From... Anguilla? 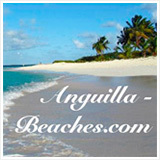 Anguilla is now our home. 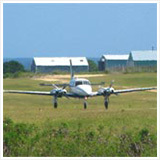 We absolutely love it, as a much a Paradise to live in as to visit. 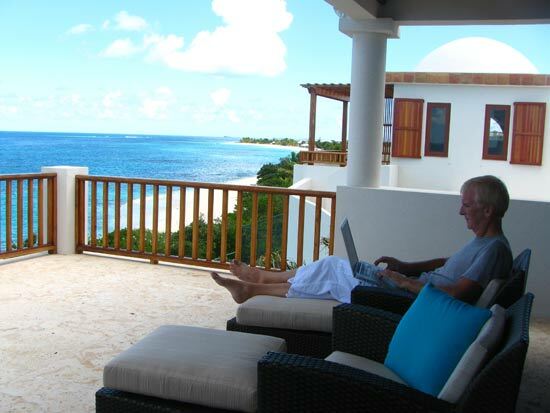 Unlike vacations, of course, long hours on computer for business are back (albeit with the sounds of the sea and cooled by steady tradewinds at our new home). The plan is to do the things we used to do every day as tourists, blending in things we've not done before. Enjoy a totally new, luxurious surrounding for a day. 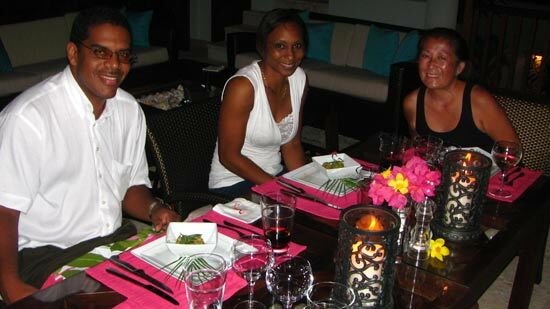 Have a gourmet meal with friends, cooked in a luxury Anguilla resort. And, of course, leave cell at home! 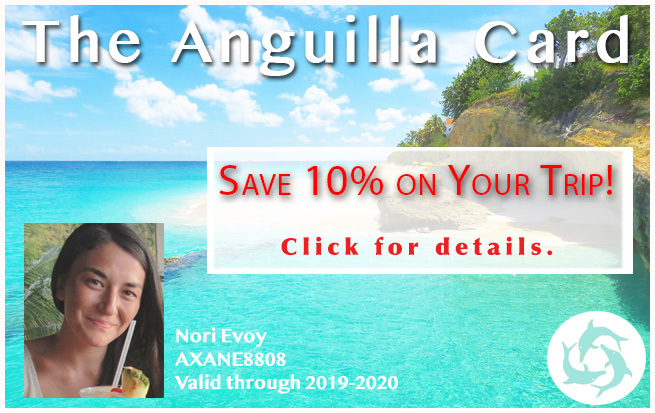 Speaking of luxury Anguilla resorts, our first decision... should we try the new luxury Anguilla villa we had heard so much about, or a luxury Anguilla hotel? Where Is The Black Pearl? 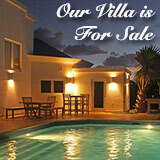 Villa Black Pearl is a well-priced luxury villa on the easy-to-reach Western end of Shoal Bay East. I immediately realized that its exotic name has nothing to do with the movie and everything to do with the plant, a local flowering bush with sensational deep pink flowers and seeds like black pearls. How did I know? The left turn sign with the charming logo, located just before Uncle Ernie's in Shoal Bay East, tipped me off. 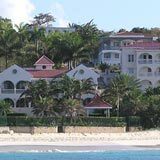 Shoal Bay East is the best beach in the Caribbean (the opinion of many top travel magazines and authorities, not just ours). 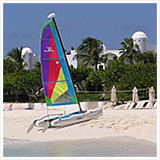 The busier part of the beach offers much in the way of sea activities, restaurants and beach bars where you can lounge with fellow beach-lovers. 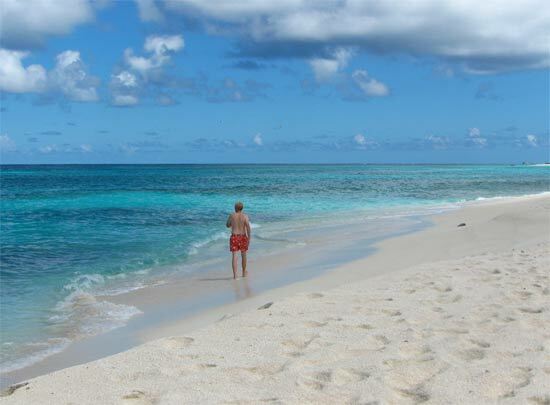 For the isolated experience, head to the western end of Shoal Bay, our personal favorite part of the beach. 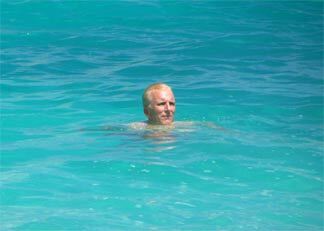 Here, you are suddenly alone with the waves. 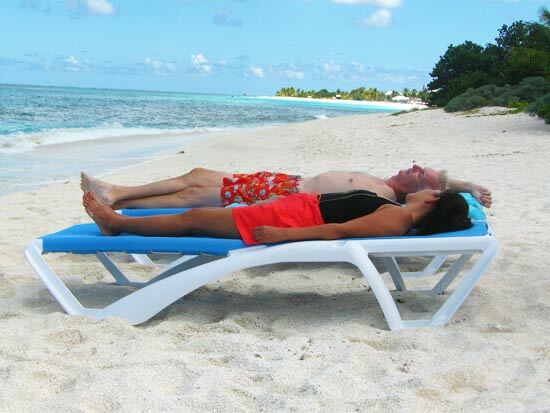 Snorkel, float or just sun on the sand. Not only is the snorkeling good here, there are even interesting walks to take off the beach (including the Fountain Cave). You'll have the beach to yourself, yet will be mere minutes by foot from "where the action is" (which still seems quiet compared to any other popular beach in the world). And the sunsets are most spectacular! 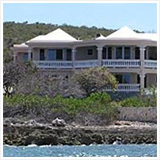 The Villa Black Pearl is on the very tip of this end of Shoal Bay East. 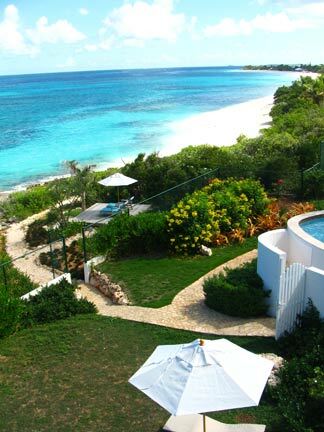 "It's time for a one day luxury Anguilla vacation," I suggested. How could Janice refuse? We made a reservation with Black Pearl's kind and accommodating manager, Lisa, for one night's stay. She was so helpful and made sure everything was ready for us, having sent us a questionnaire about preferences and anything we'd like on arrival. She greeted us with big hugs and a bigger smile. 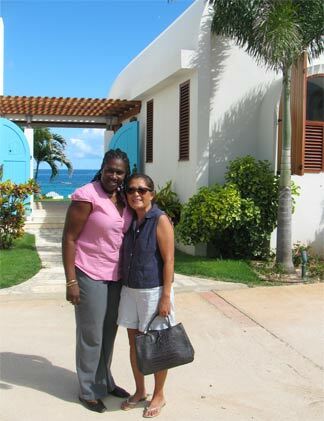 Here's Lisa with Janice by the Black Pearl's grand entrance. 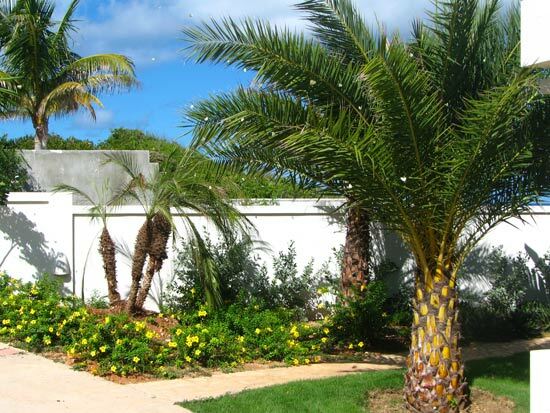 One look at the twin arches of the two pavilions of this luxurious villa and the exotically landscaped grounds convinced us we were in for a pampered day and evening. 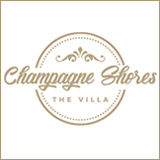 Our bags were whisked away as Lisa explained how much care and attention had been poured into the design and construction of the villa, just recently completed. The villa is divided into two pavilions. 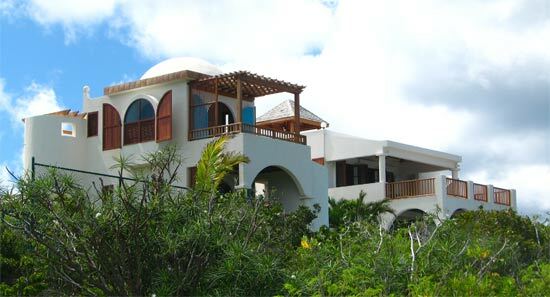 The photo below shows the front of the Eastern ("Guest") pavilion, which contains three well-placed bedrooms, each with a wonderful view of the sea. You can also see the parking area. The Western ("Main") pavilion contains the kitchen, dining and living areas on the ground floor. Spacious, with high-ceilings and flowing seamlessly into the outdoor terraces. The second floor is devoted to the Master Bedroom. And there's one more pleasant surprise... on the third floor (more on that in a bit)! 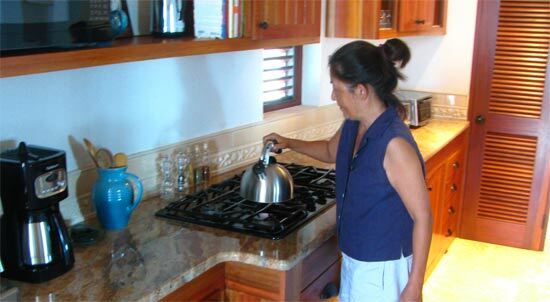 She exclaimed, "now this is a true gourmet kitchen," including such features as a 5 gasburner stove and both a cappuccino maker and a regular coffee maker! As for me? I was delighted that Lisa had already stocked the fridge with milk, soft drinks, orange juice, and beer, as well as some other snacks at the ready... even bacon and eggs and bread for breakfast. Very thoughtful. 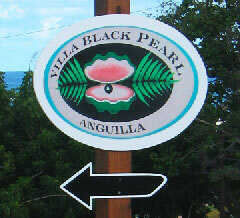 The Villa Black Pearl Logo is carved into the back of each of the dining room chairs. All of the furniture was custom-designed and built. The woods are rich and exotic throughout... Kabukali and Brazilian Cherry. The indoor dining area flows to living area, a space that is bright with natural light. 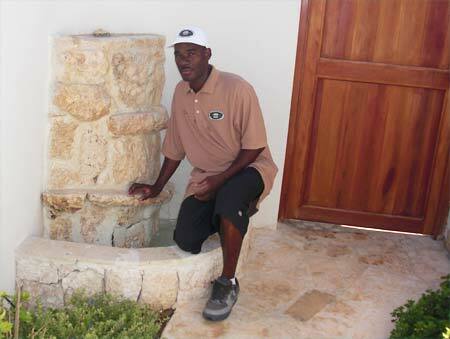 And the use of Anguilla stone as flooring was an elegant and natural touch. 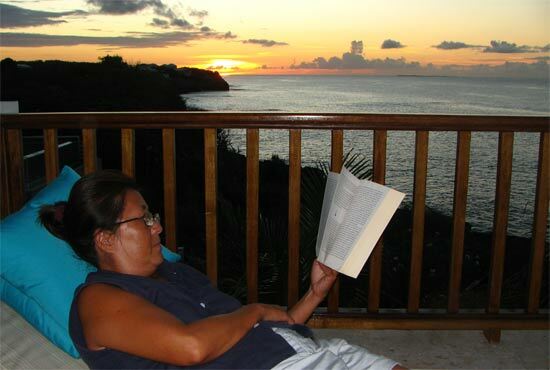 Comfortably furnished, this area offers a 42" Sony Brevia flat screen with DVD player (and plenty of DVDs), as well as a charming reading nook that Janice claimed as her own (as we'll see). Vonage is a nice touch (free phone calls to the U.S., Canada and Europe). 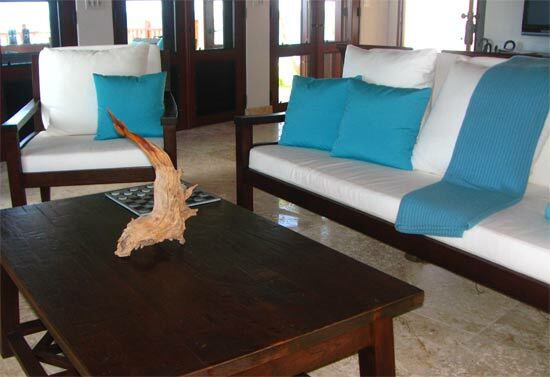 And yes, that driftwood sculpture in the center of the table is by Cheddie, one of Anguilla's most well-known artists. 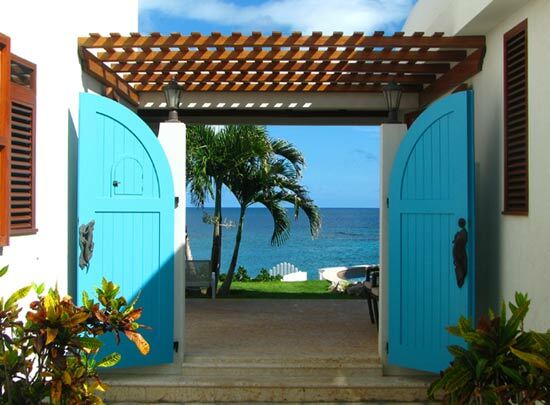 Each of the bedrooms has a painting custom-done by Louise Brooks, another Anguillian artistic treasure. 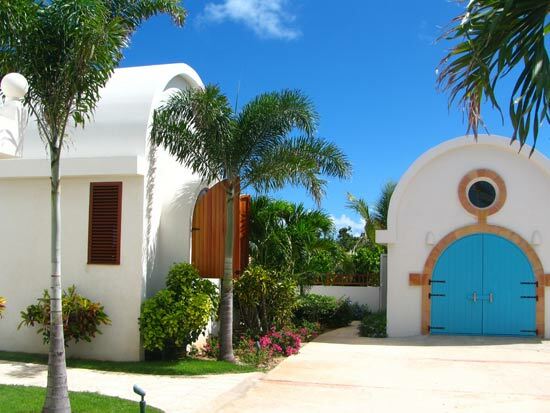 In Anguilla, good architecture merges indoors with outdoors. And the covered outdoor living space did indeed start where the indoors leaves off, the sea inviting you to eat (and live!) outdoors. This is so much more than a "terrace." Next? Up the stairs we go. 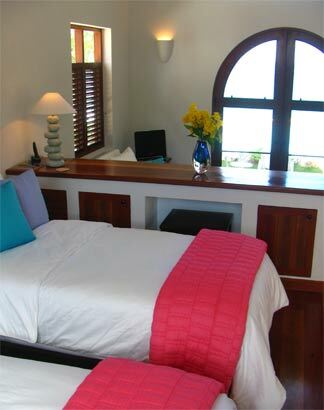 The master bedroom with adjoining bathroom and outdoor shower is upstairs, along with a spectacular terrace. The view was magic. 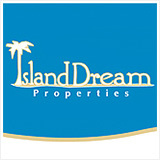 Living right on Shoal Bay's sandy shores is a dream. As you can see, storage space is cleverly tucked into every opportunity. 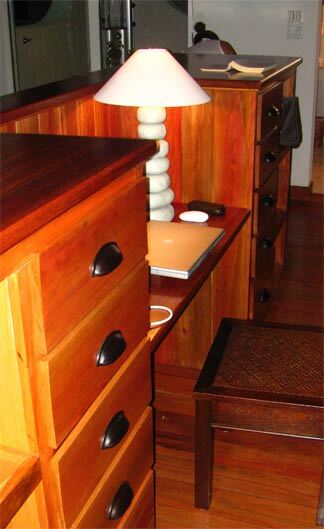 A little space for a writing desk is cleverly carved out behind the comfortable, king-sized bed. The 1000 count Egyptian cotton linen makes for one very luxurious night's sleep! 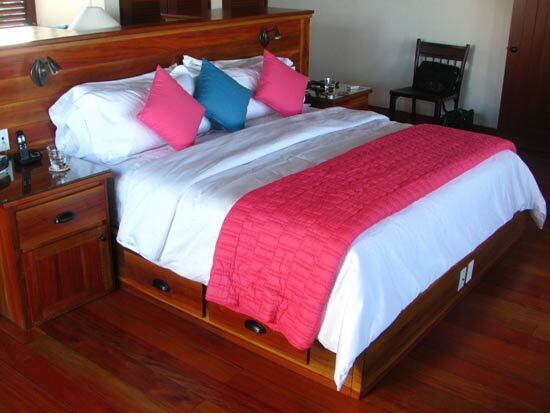 The woodwork was nicely finished throughout the villa, the Master Bedroom featuring a rich wood floor. A master bedroom which invited a glorious night's sleep. 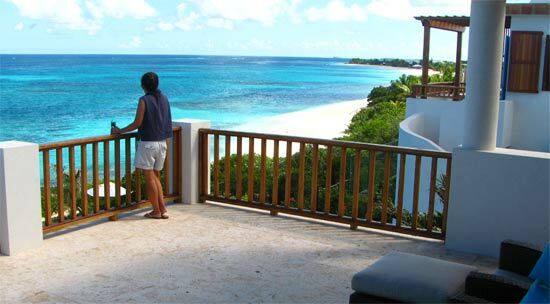 A scenic terrace with a spectacular view of Shoal Bay Beach, all the way to its point. The tour could have ended right here! This final floor is the roof deck with wet bar and gazebo. 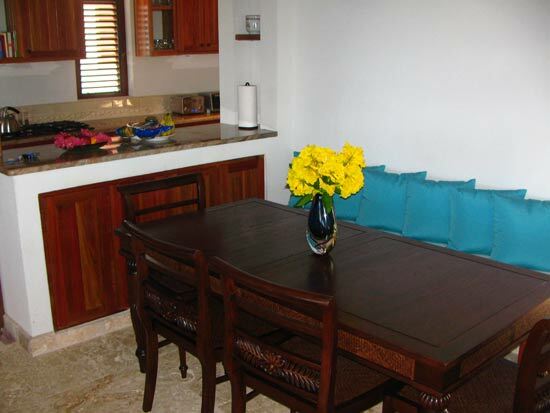 It is the ideal gathering area to hold parties and entertain friends, day or night. Or if, like us, you are the more introspective type, it's a nice, quiet perch to watch a perfect sunset, with or without a drink in hand. Janice nicknamed it "The Perch." From the photos, you can see why. Just being here is special. With a sweeping 360 degree panorama, the view doesn't get better than this! Mangificent views to the West and the East, as you can see! Amazingly, so far, we had only seen half of the Black Pearl..
Lisa, our intrepid guide, led us back down the stairs, leading us across to the Guest (Eastern) Pavilion. 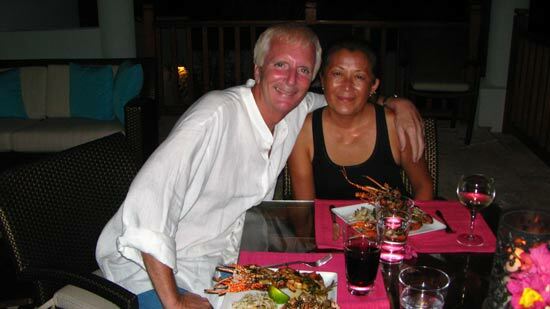 We met Brenda, who used to work at the Malliouhana, a bit later (photo below). 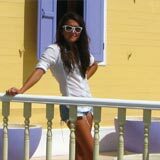 She is simply excellent, someone who laughs easily and yet is always the professional. 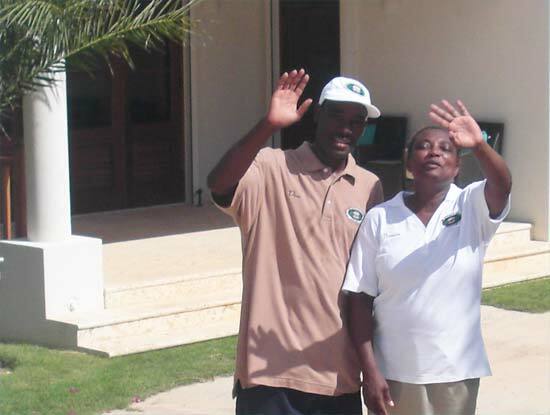 Together, Dion, Lisa and Brenda are "the friendly face of the Villa." Lisa mentioned that the Eastern Pavilion was made up of 3 bedrooms. Depending on the number of guests, 1, 2 or all 3 could be opened up. 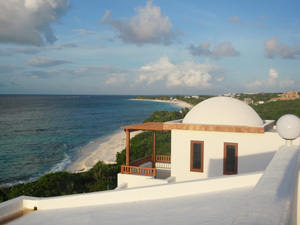 The first floor is made up of two guest bedrooms, each with their respective bathrooms and outdoor showers. 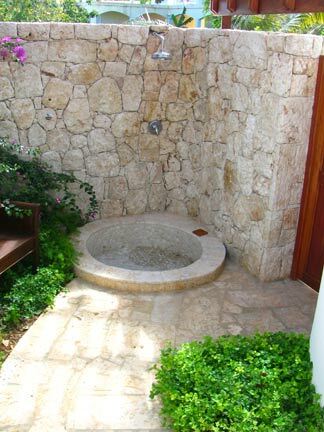 Every bedroom has an outdoor shower! Nori and Yuki would have loved the guest room with the double beds. The twin beds are on an upper level, with a private TV sitting area on a lower tier. 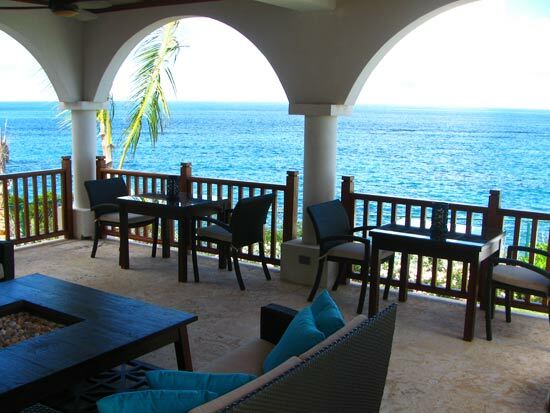 No matter where you sit or lie in that room, your view of the Caribbean is "right there." The second bedroom on the main floor opens up onto a ground floor terrace. It, too, has its own HD TV and perfect view of the sea. Upstairs, there is the third guest bedroom, a perfectly appointed room, complete with a large terrace, bathroom and yet another beautifully tiled outdoor shower. By the way, every outdoor shower is totally discrete. 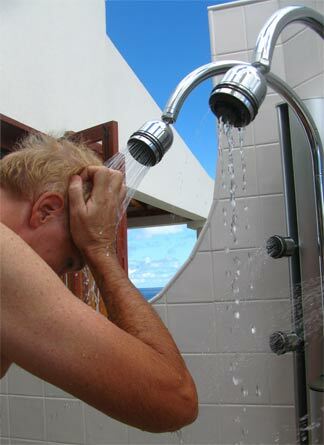 But in case you prefer to shower indoors or take a bath (or have a fear of helicopters flying overhead! ), every bedroom offers the indoor option, too! Every one of the four outdoor showers is special. My favorite was the one we used in our Master Bedroom. I'll tell you more about that one shortly. Janice's favorite, from a purely magical, esthetic viewpoint, was the downstairs one shown on the right. This shower is truly spectacular. 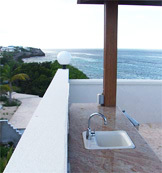 The ultimate in luxury Anguilla villa outdoor showers! If you have never showered outdoors, it takes a moment or two to feel totally comfortable the first time. Once you do, though, it's strangely liberating. Sun-seeker? 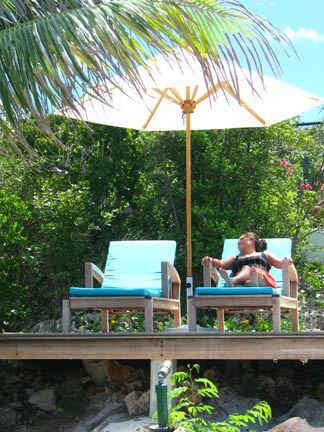 Take the sun on a choice of decks... or on the beach. Shade-lover? 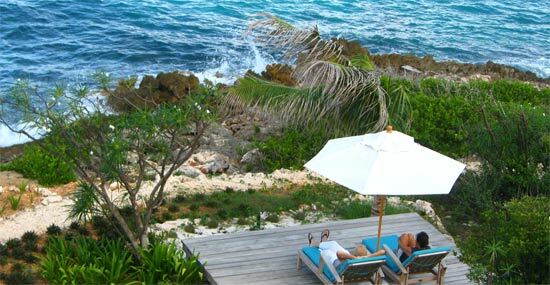 Several perfect spots for backgammon or light summer reading. 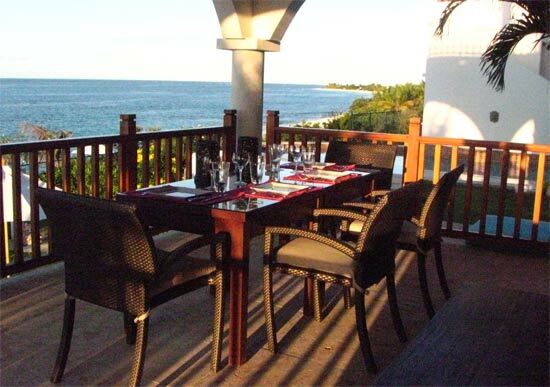 Picnic on the beach or under a bright, white umbrella, wine cooler by the table? Cool dips in the pool? Snorkeling, surf-walking, or just floating on the sea? 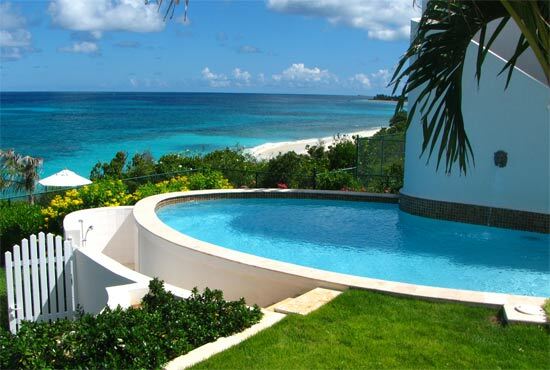 Turning around, we headed back to the villa, anxious to change into bathing suits. This photo offers a good view of the two pavilions from the seaside (Guest Pavilion in foreground). Shoal Bay is where our the tour ended. 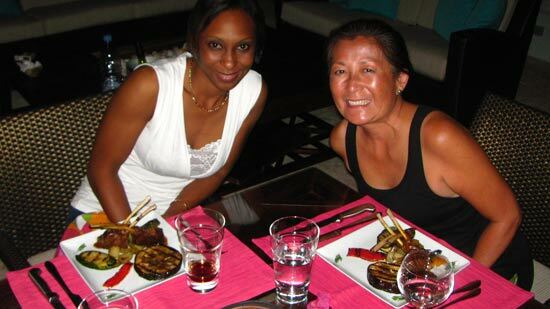 Lisa wished us a great time, let us know how to reach her anytime and our "vacation from our vacation" had begun! We couldn't resist the allure of the azure! It is a freshwater pool, with beautiful details. We asked Dion to take our picture. You can see that I'm already pinking up. Remember the sunscreen! 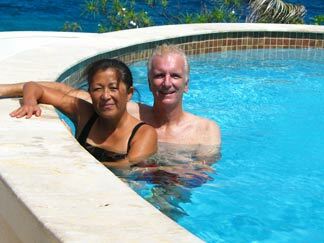 Dion Tip: There is, luckily, not much of a market for photos of Janice and me. But if you happen to be a Hollywood star, don't leave your camera with Dion! Seriously, we had a great laugh as he turned the camera over to us. He left us with some nice mementos of our day. When do you get a beach like this all to yourself? 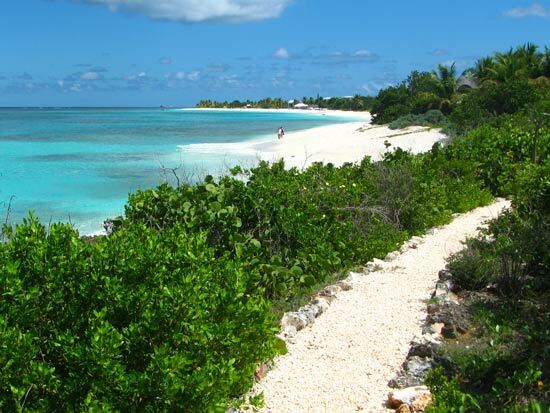 There is rarely anyone down on this end of Shoal Bay, even though it's been ranked among the best beaches worldwide. We saw several from the terraces! There were no turtles to be seen. I suppose my presence scared them away, I realized later. 30 minutes can slip by in a minute. When I looked up, Janice had returned from the beach to the deck. "Camera turnaround" is fair play. Pleasantly tuckered out from a couple of hours of the sea, the sand, the salt and sun, we headed up the path. After a quick shower by the pool to wash off the salt and sand, it was time for a nap (something we don't do enough of, just 3 miles away at home!). First, though, let's put the outdoor shower of the Master Bedroom to the test. It has six heads in all, two up top and four lower down (you can see 4 heads in this photo). You can set 1 head to operate, up to all 6. Or, of course, you can share with the one you love. There is plenty of room for two! What an experience, especially with the sun shining down and the sea in full view. A restful nap later, without any need for Air Conditioning thanks to the gentle tradewinds that cross-ventilate, we woke up to late afternoon. Meanwhile, I have to admit that I couldn't help but take advantage of the wireless Internet throughout the house. But it was just that once, and just to make sure there was nothing important. Really! I mentioned above that Vonage was a nice, thoughtful touch. It's clear that a lot of thought went into making the guest experience at Black Pearl special, including all the special outdoor details, the rooftop gazebo, and so forth. Janice kept saying, "I wish Nori and Yuki were here!" 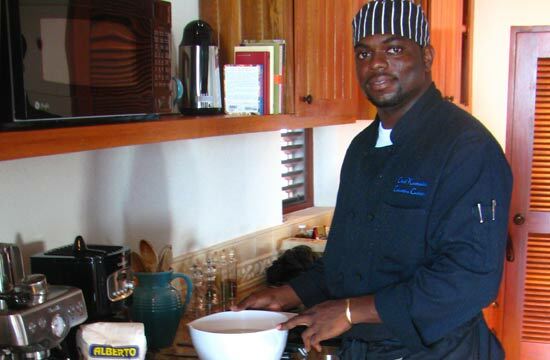 Meet Kumakie Parris, gourmet chef. 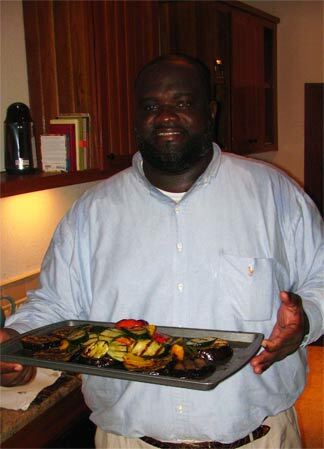 Our chef for the evening. We had selected the meal in advance from an extraordinary menu selection. We would start with the chef's scallop avocado ceviche. The third course would be a grilled rack of lamb with roasted potatoes and grilled eggplant, zucchini and bell peppers. "Locally caught crayfish seasoned with an elegant mix of seasonings and the shrimp skewered on fresh rosemary sticks. Served w a mix of long grain wild and yellow rice elegantly plated and topped with spinach tomato and garlic butter sauce." Kumakie told us that he had that disk in his head for some time and this was the first time he "put it together." It was well composed, the flavors melding perfectly. And finally, for dessert, we kept it simple... chocolate pound cake and brownies. We had invited our friends, Dr. Clyde Bryan and his wife Jill, to join us for this very special meal. The meal was more than perfect. The company was even better. We always have excellent conversations, but the food and wine pushed our evening to special heights. I can't think of a better time spent with Jill and Dr. Clyde Bryan, great friends on a wonderful evening. Thank you Kumakie and Deon. Later, we went out back and gazed at the Milky Way. 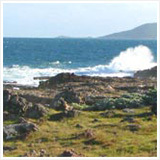 Dr. Bryan waxed philosophical about this part of the island and how special it had always been. And it certainly had was for us that evening. The next morning, we woke up late (this was our vacation, after all!). Janice made some tasty bacon and eggs. I, um, set the table overlooking the sea. Like I said, there is not much call for indoor dining. Thank you very much, Lisa, for stocking the fridge. Another thoughtful touch. Whatever you want, just let Lisa know and it will be there for you upon arrival. 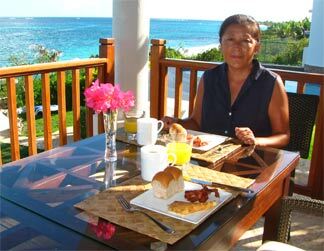 A delicious breakfast, in the perfect setting. We had spent 24 very special hours.